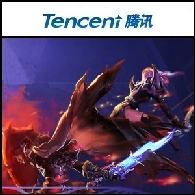 Tencent Holdings Limited (HKG:0700) is an investment holding company. The Company, along with its subsidiaries, is principally engaged in the provision of Internet and mobile value-added services, and online advertising services to users in the People's Republic of China (PRC). The Company’s other operations consists of provision of trademark licensing and instant messaging services in business enterprise solution. During the year ended December 31, 2008, the Company acquired 20.02% equity interest in an online game company, 25% equity interest in a venture capital fund in Asia, and 30% equity interest in a mobile game developer in the PRC.